VANCOUVER , March 4, 2019 /CNW/ - Boreal Metals Corp. ("Boreal" or the "Company") (BMX.V) is pleased to report assay results for the remaining four holes from the recently completed nine hole 1,620.8 metre diamond drill program at its 100% owned Gumsberg project located in the prolific Bergslagen Mining District in southern Sweden (see Figure 1). "The continued success intersecting multiple high grade precious and base metal massive sulphide mineralization in the new South Zone is very exciting for the Boreal team, as our initial thesis was always to prove that around these old relatively untested mine workings new economic discoveries could be found," stated Patricio Varas , Executive Chairman. "These intercepts increase our confidence in the upside exploration potential throughout the + 20 km long belt land position which has not been explored using modern exploration methods." Mr. Varas added "textures in massive sulphides intercepted previously were interpreted as remobilized massive sulphide veins however these new results contain textures that we interpret to represent primary VMS mineralization. A down hole geophysical survey scheduled for first quarter of 2019 will help us vector toward what could potentially be new discoveries at Östra Silvberg." Lengths reported as seen in drill core - true widths are estimated to be 50% of reported intervals. In December 2018 and January 2019 , Boreal completed nine diamond drill holes in the vicinity of the past producing Östra Silvberg Mine (Figure 1). Diamond drilling tested prospective stratigraphy east, west and down-plunge of the previously reported intercept from BM-17-005, which returned 10.94 metres of 16.97% zinc 656.7 g/t silver, 8.52% lead and 0.76 g/t gold south of the main Östra Silvberg mine workings (see Boreal News Release dated February 28 , 2018). 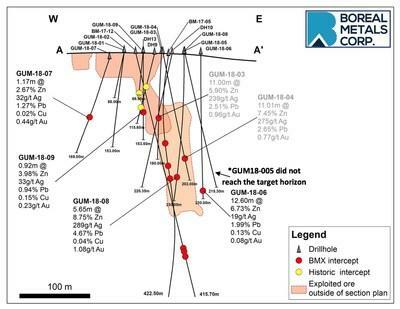 Holes GUM-18-006, GUM-18-008 and GUM-18-009 were drilled to test down-plunge and along-strike continuity of newly recognized remobilized silver-zinc-lead-gold mineralization that occurs 50 metres south of the historical workings which was intercepted in BM-17-005 in Boreal's 2017/2018 program and again in holes BM-18-003 and BM-18-004 (this program). GUM-18-007 tested the down plunge extent of historically mined mineralization exposed at surface (Figures 1 and 2). Drill holes GUM-18-006 through GUM-18-009 were successful in expanding the newly discovered zone (Table 1). Drill hole GUM-18-006 cut two zones of pyrite-rich massive sulphide lenses which returned significant lead-zinc mineralization interpreted to represent the primary sulphide source of the remobilized sulphides. The presence of high grade remobilized veins and primary volcanogenic massive sulphide mineralization significantly upgrades the potential at Östra Silvberg. Six of the nine holes drilled at the Östra Silvberg cut significant mineralization which constitutes an expanding zone of newly recognized mineralization that remains open to the east and at depth. The strategically situated Gumsberg project consists of six exploration licenses in the Bergslagen Mining District of southern Sweden totaling over 18,300 hectares, where multiple zones of VMS style mineralization occur. The VMS mineralization at Gumsberg was mined from the 13th century through the early 1900s, with over 30 historic mines present on the property, most notably the Östra Silvberg Mine which was the largest silver mine in Sweden between 1250 and 1590. Despite its long-lived production history, relatively little modern exploration has taken place on the project. New geologic interpretations, geophysical surveys and reconnaissance drilling have led to the identification of multiple new exploration targets near the historic workings. Daniel MacNeil , P.Geo, a Qualified Person as defined by National Instrument 43-101, has read and approved all technical and scientific information contained in this news release. Mr. MacNeil is Vice President Exploration for Boreal Metals Corp.